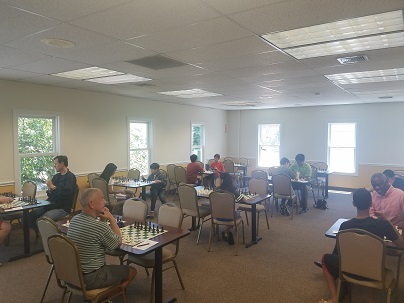 This week's Sunday Quads hosted 14 total players making up 3 sections, one of which was a six-player Swiss. Quad one came down to the final round encounter between experts Bryan Weisz and Grant Wang who so far both led with perfect 2/2 scores. Wang was eventually able to triumph in their last round game to win the section. The second quad was much more closely contested as after two rounds no player was unscathed. Luis-Jaime Casenas and Rich Tanenbaum both went undefeated (with a couple of draws each) to share first palce with 2/3. Luis-Joshua Casenas followed closely with 1.5/3. The last section of the day was a six player swiss. Cayden Yang won all three of his games to win clear first and take his rating over 1500! Carl Scovens and Sanah Rekhi shared second place with 2/3 each. Thank you to everyone for coming out!